My kid had cold chicken nuggets for breakfast. In the car. And we didn’t stop at McDonalds. This is the eighth day I’ve used dry shampoo. We were running late for daycare, so I pretended that I didn’t notice the dirty diaper before leaving the house. I’ve pretty much stopped wearing normal bras since I discovered these sleep nursing bras. I see that smirk on your face right now! You know exactly whom I’m describing! Or was that a grimace instead? If you’re still looking for that one friend, we’ve got some great tips for you on making mom friends and experiencing mamaraderie. It’s not as scary as it feels! If you’ve got a mom like that in your life, what better way to thank her than in snickers, snorts, and sarcasm? Truth is, humor is an all-too-frequently forgotten love language and one of the best coping mechanisms for facing the trials of raising small monsters, uh, I mean children. Yeah, I definitely meant children. 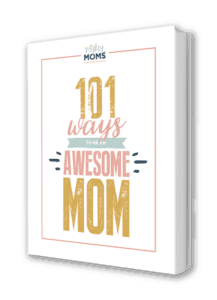 So I scoured the Internet for some of the snarkiest, wittiest (yet inexpensive) mom gifts available to surprise a chummy mummy. Cheap gifts for cheap laughs. You’re welcome. What’s a mom’s favorite food group? Coffee. The real black gold, am I right? Coffee is funny in the same sense that water and oxygen are funny. But the mug you serve your coffee in can be hilarious! Help your mama pal start her morning (or afternoon, evening, whatever #nojudgmenthere) off with wit and sarcasm. Because mornings are hard and coffee is life. For the mom who is essentially Wonder Woman with kids. That moment when the kids need reminded who the boss is. Because mommin’ isn’t always pretty, but she still is. Perfect for the sensitive poet who is not a morning person. If her coffee spends more time in the microwave than in the carafe. A to-go option for those who need it to drive or operate heavy machinery. For the mom whose bathroom feels like an amphitheater. In case she ever finds it suspicious that she actually left the house on time. Every mom dreams of having that cup of coffee to herself. But is it truly possible to enjoy coffee if you aren’t dripping in children? Science may never learn the answer. But theoretically speaking, books go great with coffee, so I’ve found a few that aren’t written by Dr. Seuss or A. A. Milne. These are the perfect mom gifts for friends who love to read, but don’t have the energy for Dickens or Patterson. Pure candy reading fluff. That’s what these books are. Encouragement wrapped in tongue-in-cheek hilarity. For your friend who likes to sit down and color with the kids. The perfect gift for a mom who has recently lost her cool. Because dads aren’t that different from moms after all. The perfect satire for battling Instagram Inferiority Complex. Not your average baby milestone checklist, great for new moms. For something a little more heartfelt, but still hilarious. A particularly dry-humor look at screwing up motherhood. Believe it or not, there is a level of mom exhaustion that can render a person too worn out to crack jokes. When your kids have depleted your humor reserves with endless requests and constant rounds of “Mom!”, being able to display your unfiltered emotions right on your sleeve can really come in handy. No words necessary. Try some of these on for size! Because sometimes even the most well-trained kids are lazy kids. When superhero powers don’t mean superhuman energy. How to own up to what her kids are thinking anyway. At least … that’s what it feels like as a new mom. If you just want to honor her for what she means to you personally. For the sleep-deprived mom friend who never gets to fully recharge. Not a t-shirt, but definitely perfect for a mom of picky eaters. Also in the not-a-shirt category, a perfect alternative to dry shampoo. Because the mental toll of motherhood is sometimes just too much. Girls can be dragons too, but boy moms get a cool Game of Thrones pun. Ever walk into someone’s home, and find something in the corner that strikes you as so sneaky and hilarious that you instantly feel like you’ve discovered a kindred spirit? That’s what these mom gifts do. It’s like a hidden code that only other exhausted parents can really appreciate, scattered around the home like a hysterical treasure hunt. A magnetic reminder that her list of house rules will never be complete. A fun proposal for an alternative to laundry day. The “I opened my mouth and my mother came out” pillow. The perfect welcome mat to put out before a dinner party. Because no one actually uses the bathroom to “powder their nose”. She’s encouraged you a lot—like when you confessed to losing your cool with the kids and her response was “Been there!” and a hug. Anyone can get a gift at Christmas and at birthdays, but who ever receives a gift simply for being awesome? Now it’s your chance to start a new trend and honor her for the life-giving, soul-enriching presence she is. Either by one of the hilarious mom gifts above, or perhaps a more serious soul-squeezing encouragement. Chances are, your mom friend is coming in dead last on her own priority list. It’s just part of the Mommy Nature. But oh, what an encouragement one tiny, hilarious mom gift can be! Friends, momming is tough. We need to remind we each other that we get it, and that none of us are alone. Whether that be through cheap mom gifts or even just a simple text to check up on her, let your go-to mama friend know how much her friendship means to you. Who knows? Maybe she’s thinking the same thing about you?